The following article is about the Theory of Everything (TOE) and more specifically about String Theory and where it stands today. I do not expect anybody to understand the “science” of the article, but I hope that you get a sense of the tone. We have entered a realm of scientific investigation where the mathematics far exceeds what can be experimentally shown. It will probably remain that way for a long time because the energies required to create the conditions under when the theories can be proved or disproved are not practical. For example, what if a certain phenomenon can only be observed under conditions that exist related to the energies involved in the presence of a black hole? I used to think that science needs to keep digging deeper and deeper into the fundamentals of existence, but I am beginning to wonder if there is a useful purpose to this endeavor beyond a certain point. Does any of this really help us understand more about ourselves or have the potential to help us in some way in the future? Even if the experiments to prove something about the TOE were to become practical some time in the very distant future, what if the energies required to set up the experiment to prove it are of an order of magnitude that would change the conditions under which the experiment has been conducted in some irreparable way? Would there ever be a reason to conduct such an experiment? It would be like eating the apple in the Garden of Eden. The comments related to this article below (seen at the end of the article) may be more enlightening than the article itself. You get to a point where the conversation can seem to have overtones that are similar to those when talking about religion. Does science as defined today become pointless beyond some point? The democratization of “science” and “information” by the Internet has enabled many strange things today, including acceptance of lines of thinking that one would have expected reasonable people to scoff at in the past, and events that some people would consider quite surprising during our times, such as the results of the US presidential elections in 2016. NASA presented some preliminary findings from their Twins Study earlier this year. A complete paper from this study is to be released later this year. For those who are not familiar with this study, this is the first and only study done on twin astronauts comparing the one who spent 340 days in space (Scott Kelly) with his brother (Mark Kelly) who spent the same time on earth, to try to understand genetic changes due to long term space travel. The twins had identical genes when the experiment started. They found that the person who had lived in space went through some genetic mutations during his time in space, and that some changes in gene expression (which apparently is not the same as genetic changes) seem to be long lasting. Our living environment deeply impacts what we are as a species inhabiting the Universe. We are shaped by where we exist in the universe, and there is some kind of a process that causes us to develop in a certain manner in different environments. Scott Kelly spent less than a year in Space before the changes in his body manifested themselves. Consider the near certainty that the magnitude of the differences caused in species because of where we exist in the universe likely outweighs our differences due to our existences in different places and in different circumstances on this earth itself. Why then are we bent on focusing on and exploiting our own relatively minor differences? And do we really think we are the superior species? I first learned about how ants work in a cooperative manner in a book that my daughter had bought me for Christmas. The book was all about trails. (She had figured out the perfect book for my interests!) There is a chapter in this book about how trails historically came into being, and how these have, over time, led to our modern day system of roads, railroad tracks, and other connections for human travel. Trails have existed for ages. The concept is not the creation of humans. Animals of different kinds, using different skills, and for different purposes, have created trails. There was, and still is, no real planning involved (the way humans would define it) in the creation of animal trails. It is all tied to their inbuilt instinct to survive and exist. Ants have been creating trails for a long time. 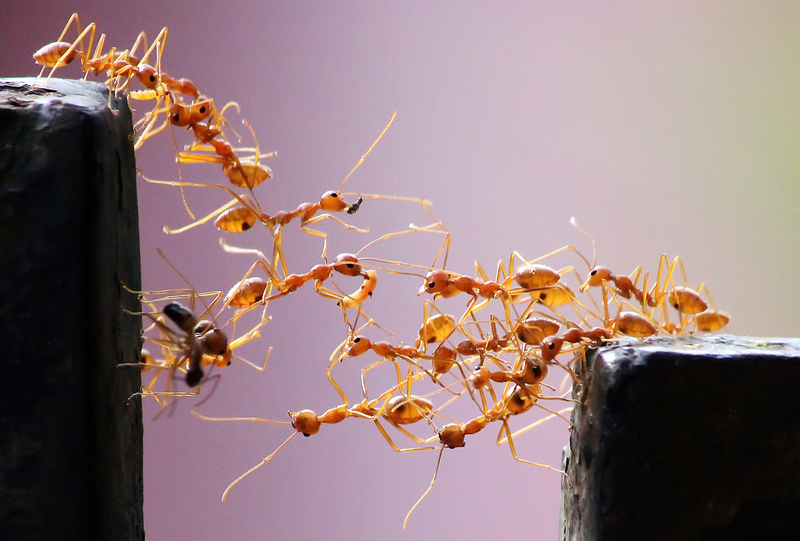 The notable thing about the behavior of ants is that in spite of the fact that they do not have any significant level of individual intelligence, they show a great deal of collective or cooperative intelligence that lets them be effective in complex tasks. (They do not even depend on the presence of an occasional “smart” ant that can serve as a leader.) The book describes how their processes work for creating very efficient trails. (There is even a kind of ant that is blind that is still very effective at this.) Humans are now trying to understand if any of these processes are useful for our own existence. Anyway, the article I have linked to is fascinating. Make sure to watch the videos!